We here at Hill & Schneidmiller DDS love to teach our patients about dentistry and some of the inner workings of our dental practice; not just for the sake of transparency, but also to broaden the horizons of all those who seek knowledge and would like to learn about dentistry in particular. You may have noticed that when Dr. Hill and Dr. Schneidmiller look in your mouth, they always use glasses. Often times, these glasses have mini-microscopes on the lenses and appear a bit different than traditional reading glasses. This is because these are special dental glasses known as “loupes” and provide the eye enhancing capabilities needed to perform proper dental analysis or treatment. Both doctors love how these “loupes” magnify and sharpen what they can see in the mouth, especially way back in the darkest corners. Because of this extra-sensory vision, the doctors are able to actually see tiny problems like spider web fractures, beginning decays and failing fillings even before the patient has symptoms. Coupled with information from our Hygiene Specialist, Ashley, or from information on an X-ray, many problems are avoided or treated more conservatively. This makes our patients (and their pocketbooks) very happy indeed. 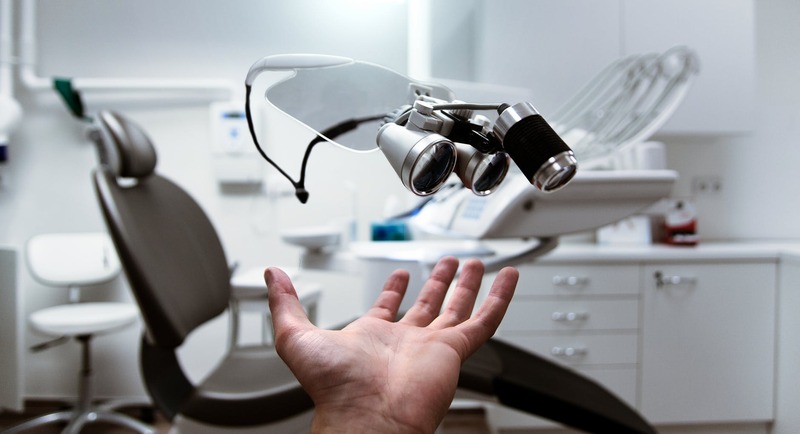 If you’ve been feeling a little bit nervous about your oral health and would like Dr. Hill or Dr. Schneidmiller use their dental glasses on you, feel free to call us and schedule an appointment. Our phone number is (619) 460-8211. We’ll “see” you soon!